Daughter of the infamous King Henry VIII and Anne Boleyn, Queen Elizabeth I was an incredibly influential woman in regards to religion, politics, women's rights, and even fashion. One of the best ways to emulate this famous queen is through costume. A Queen Elizabeth costume should be regal and beautiful. This may seem hard to achieve, but with hard work and concentration, almost anyone can make a Queen Elizabeth I costume of which they can be proud. For the skirt, cut out a piece of taffeta fabric that is 1 m x 2 m (1 yard by 2 yards). Fold the fabric in half, bringing the two shorter edges together. Sew the shorter edges (opposite the fold) together. Hem one raw edge of the fabric. To form the waistline, hem the other raw edge of the fabric, leaving a 2.5 cm (1 inch) opening. Cut a piece of elastic that is just long enough to wrap around your waist. Thread the elastic through the waistband, using the 2.5 cm (1 inch) opening and gathering the fabric as you go. Hand sew the two ends of the elastic together and hand sew the 2.5 cm (1 inch) opening in the waistband closed. Make a corset according to the instructions in the Corset Pattern Generator Web page (see Resources) section of this article. Use the upholstery fabric, eyelets, and corset laces for this step. To make a ruffled collar, cut a piece of white fabric that is 12.5 cm (5 inches) wide and long enough to wrap around your neck plus 5 cm (2 inches). Hem the white piece of fabric all the way around. Sew a white button onto one end of the fabric. Sew a button hole in the other end. Cut out 5 pieces of ruffle fabric trim that are each as long as the fabric piece from step 7. Hot glue each of these ruffles around the fabric to form the ruffle collar. Hot glue fake jewels on the costume wherever you feel it needs embellishment, such as the neck and waistline. Dye your hair red or wear a red wig. Loosely pin the hair back onto the crown of your head. Wear the outfit with a white, long sleeved shirt. 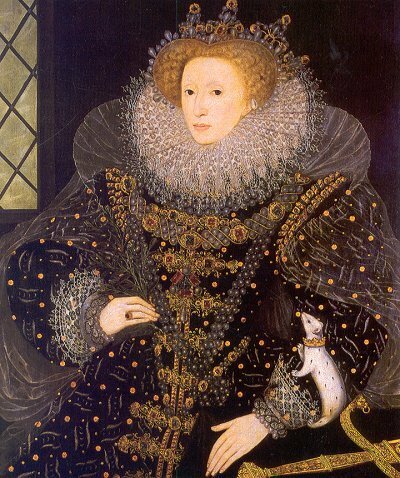 Refer to a picture of Queen Elizabeth I (see Resources).